In September we posted up a chart of top secret Starring You projects in progress. Just a few months later we had completed a slew of them to cap off 2010! Here’s the list in a more complete form. Believe us, it felt good to put that last skull sticker on the chart. Not including new birthday and special occasion content, JibJab’s 2010 saw Skiing, Figure Skating, 80’s Workouts, Breakdancing Leprechauns, the Star Wars Trilogy, Soccer, Kitchen Musicals, Kung Fu Moms and Dads, our Dad Rap, the Founding Father Rap, Mad Men, Halloween Rap, Frankenstein and dozens of holiday movie variants. 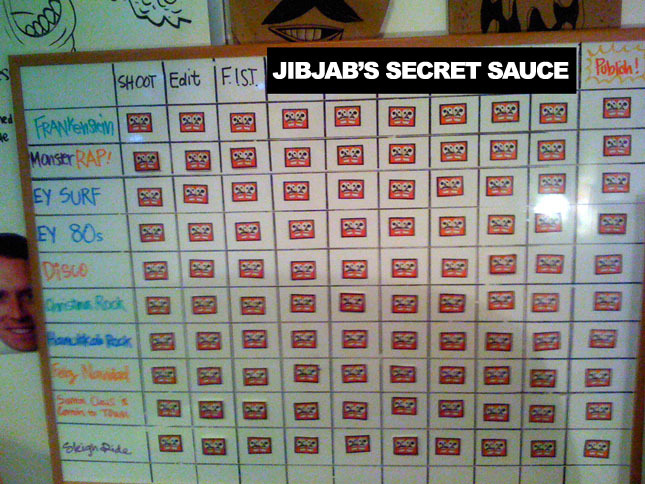 Time to do it all over again, what do you think JibJab should tackle in 2011? This entry was written by paulhanges and posted on January 5, 2011 at 1:56 pm and filed under Inside JibJab. Bookmark the permalink. Follow any comments here with the RSS feed for this post. Trackbacks are closed, but you can post a comment. One BIG demographic area I think you guys are missing are family and kid friendly JibJabs. I’ve tried to find birthday JibJabs for my girlfriends 5 yr old granddaughter. She LOVED the Christmas Santa JibJab I did of her and her little 2 yr old brother! There should be a TON of parents and kids that would put pictures into JibJabs just for fun, for bithdays, and other popular kid stories, TV shows, and movie themes. Hopefully another big profit center for you guys!